Advanced Gitnsmtthing of gasoline and the air hose attached to the large end of the first piece to wash out the cuts inside of a receiver to clear them of oil, sand or other grit in no time. .
Commercial-type air-blast nozzle to attach to air hose. Another use of the air compressor is to supply air to air-driven tools and by that I do not mean riveting hammers but the line of small hand grinders, filers and chisellers made by the Madison Kipp Corp. of Madison, Wisconsin. While the gunsmith does not have much, if any, use of the filing or chisel tools, he can make good use of the grinders. These tools weigh but a few ounces, cost from $7.75 up, handle mounted grinding points of various shapes, also small grinding wheels, polishing points of any shape in small sizes, small metal-cutting burrs and have speeds up to 100,000 revolutions per minute. The exhaust air from these tools is expelled at the lower end, just back of the grinding or cutting point being used, and by this keeps the work blown clean at all times, and this blast also keeps small metal particles away from your facc and eyes. They do, however, howl like a banshee and take about four to five cubic feet of free air at 40 to 50 pounds pressure per minute. This air requirement means that it will require the average garage-size compressor to supply them. Washing nozzle. Air hose connects to large tube. Small tube goes into can of gasoline or kerosene. steel but these electric grinders can be reduced in speed by foot-controlled rheostats, such as those used on an electric sewing machine. Incidently these burrs, running at low speeds, will drill harder steel than a twist drill will penetrate, but the feed is necessarily slower. The regular dental engine or drill must be mentioned in connection with these power-driven hand tools mainly because of it being exactly the proper speed for using the cutting burrs on steel. xAnother reason for mentioning it is that it can often be obtained from a dentist for next to nothing, after it has been replaced by a later type. Also old burrs may be obtained from the dentist that arc too dull to cut teeth well but will still cut steel easily. These dental burrs may be purchased new, from dental supply houses, if your dentist cannot supply certain shapes or sizes that you desire. These dental engines do not usually have a high enough speed to do good work on steel with grinding points or with polishing wheels, but can be used for this purpose at a pinch. The flexible-shaft style dental engine made by the Dumore company has a double speed range, one by attaching the shaft directly to the motor spindle and the second by attaching it to a reduction gear at the opposite end of the motor spindle. These give a high enough speed to handle grinding and polishing points in good shape while the low-speed side does well with the cutting burrs. 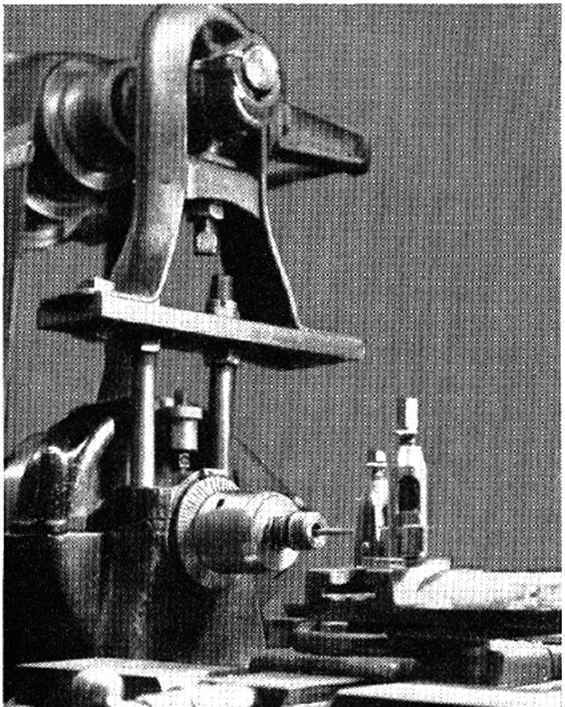 Dental engine or drill fitted with a dental burr being used to cut out a sight blade slot in a ramp. A line of small holes being first drilled. Above are shown felt buffers and abrasive sleeves, etc., while tungsten steel cutting burrs arc shown below. A hammer attachment may be obtained for these dental engines that changes the revolving motion into a reciprocating one. It looks a good deal like an ordinary dental handpiece and slips onto the lower end of the regular handpiece. It has removable points or tips, and you can shape the ends of these tips into various shaped points, such as sharp point, diamond point, etc., and do matting work on receiver rings, bridges, barrels or anywhere else you wish. The stroke of these hammer attachments can be regulated from light to heavy, after some practice very good work can be done much faster and more evenly than can be done with a hammer and punch. Hammer attachment for dental engine and its use for matting receiver ring. making quite often and for fitting new hinge pins in double or single-barrel shotguns, as well as for straightening or bending work. An anvil of small size should be provided, because just as sure as you don't have one you will be pounding things on vise bars and jaws; vises were never designed for this service and won't stand it very long either, A good vise must be in the shop of course, in fact, two of them, one a regular bench type of good size with swivel base and also a swivel body if possible, so that the vise may be laid upon its side with the jaws vertical instead of horizontal. Until you use a vise of this type, you cannot realize how much superior to the horizontal jaw type it is. The usual thickness of a vise jaw from top to bottom is slightly more than an inch and in working on the ends of rods, barrels or gun stocks this gives you very little gripping power, but your vise jaws are five or six inches in length and when the vise is turned onto its side you have all this length available for grip, which makes a great improvement in the holding power of the vise. 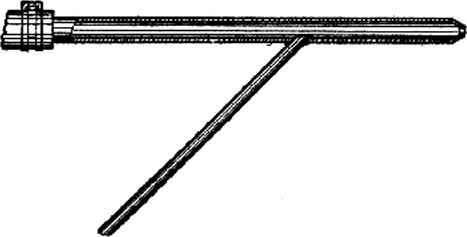 There are several makes of vise which can be turned upon its side in this manner. There is one point to watch for in picking out or fastening a bench vise, and that is to see that the inner jaw-face extends beyond the edge of the bench, so that the bench edge will not interfere with long work held in the vise and extending down toward the floor. The sccond type of vise necessary is the so-called machine vise with smooth and square bottom and sides, so that it may be used upon the drill press or milling machine to hold work being machined. These come in a number of sizes and types, a low-cost type of sev' eral sizes being made of cast-iron by North Bros. Mfg. Co. of Philadelphia, under the Yankee brand. These vises have swivel bench bases which enable you to use them upon the bench, but by loosening one screw you can remove them from the bench base to use on the drilling or milling machine. Other machine vises made of steel or semi-steel are supplied by various companies ^at various prices. One made by the Chicago Tool & Engineering Co. can be tilted upon its base to various angles. This vise, in cast-iron, sells reasonably. Lathe setup for rough boring a chamber in a rifle barrel. In rough chambering a barrel in the lathe by using a boring tool, the barrel is adjusted in the chucks so that the bore runs true. The compound rest is then set at the proper angle to the renter line to bore the chamber at its correct taper, but undersize so that a finishing type chambering reamer can afterwards be used by hand to complete the chamber. All feeding of the boring tool in this operation is done by the compound rest screw. cost, these can be picked up from any junk dealer. Vicc jaws necessary for giinsm¡thing jobs. A are heavy felt jaws, backed with Va" red or black hard fibre. 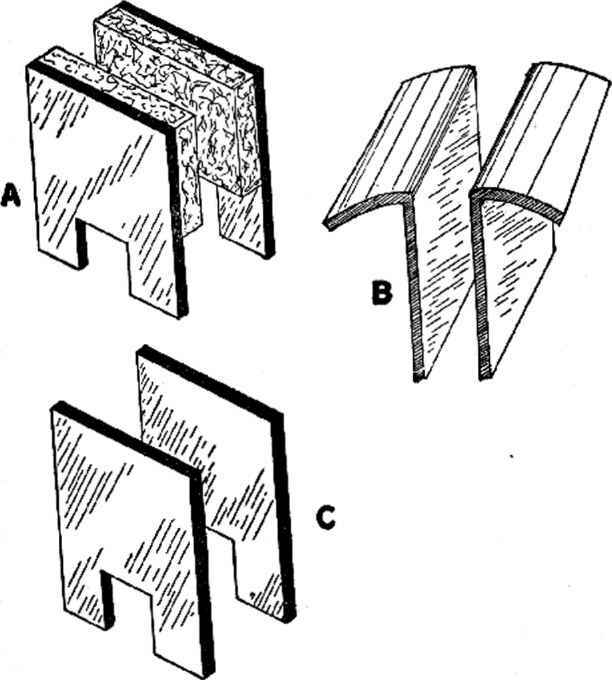 B are soft-type jaws, made of lead, brass or copper. C are of lA" sheet Bakclitc. in position at the proper height, drill a Y\r hole in the lower edge at the center and fit a piece of }4" rod into this hole to reach into a hole in the top of the vise bar in front of the outer or movable jaw. This will keep the taper jaw at the proper height and it will move back and forth with the movable jaw. Vee-block jaw for machine-type vise and swivel-jaw of steel to hold tapered work. it can be bolted or clamped to a heavy bench leg or a roof supporting post. Steel bushings 3" long and 1 Yi" outside diameter are bored to a taper to fit the contour of the outside of the rifle barrel to be removed and this bushing is then split lengthwise, so that it matches the split in the pillow block. The gunsmith has more use for the Swiss-type files than for the ordinal type. The Swiss-type is more expensive but is a longer-lived file, leaves a better finish and is supplied in more shapes, especially in the small sizes, than is the common file. Swiss-type files are made in this country by the American Swiss File & Tool Co. of Elizabeth, New Jersey, by Nicholson File Co. of Providence, Rhode Island, Heller Bros. Co. of Newark, New Jersey and Carson-Newton Co. of New ark, New Jersey. Imported Swiss files of Antoine Glardon (the famous fish brand) are supplied by William Dixon, Inc. of Newark, New Jersey. 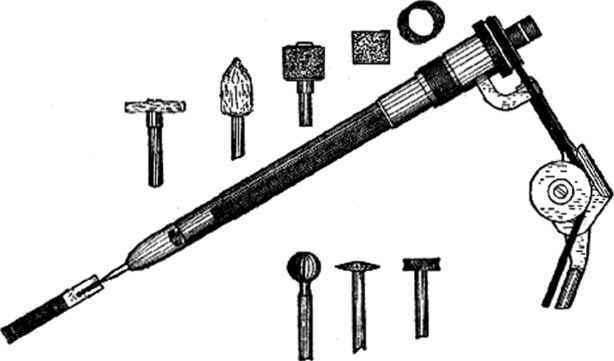 In looking over these file catalogs you will notice files with double ends, sharpened at the ends only, called die sinkers rifflers in the small sizes and silversmiths rifflers in the large sizes. This type of file will be found very handy, as they are extremely sharp clear to the point and in a place where you can get a stroke of only a very short length, where an ordinary shape or type file will not work, these rifflers cut nicely. Another advantage of the Swiss-type file of the needle file and escapement file series, is that the edge-type files, three-square, slitting, etc., really come to a knife edge, which the ordinary file does not do. A few large flat files of the pillar type, in a fine cut, are necessary for striking barrels and in squaring flat surfaces, which is very hard to do with a small file. Remember, in buying files, that the larger the file is the coarser the cut becomes for the same number. This means that a #2 cut file in a 6" length is a very much finer cut than a #2 cut in a 12" file. 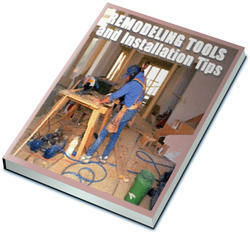 For laying-out checking on steel surfaces there is a file available called a checking file. It is a flat file and the teeth on it are set in rows, so that when used it cuts shallow grooves. These may be obtained cutting various numbers of lines per inch. They are used only for marking-out the checking, which is then finished and brought up to points with a three-square file of the escapement or needle type. Files may be bent to various shapes by heating them red-hot and bending the points against a piece of brass, meanwhile keeping the file red-hot. The file may be rehardened by heating it to a cherry-red and plunging it into cold water. If a file is heated in a forge or blow-torch flame, the teeth must be protected to prevent them from scaling, which is caused by oxidation. For protecting the teeth, a substance callcd file hardening compound is used. This is made of one part pulverized charred leather (put this through a #45 sieve) one and one-half parts fine family flour and two parts fine table salt. Mix these dry and add water slowly while stirring, to avoid lumps, until the mixture is about as thick as varnish, then apply it to the file teeth, before heating the file, in a thin, even coat with a brush and dry it thoroughly over a slow fire. After the file has been heated and bent, brush the compound from the teeth and recoat them, drying the compound as before, then heat the file to a cherry-red and plunge it into cold water to rehardcn it. If the file is heated, to be either bent or hardened, in a flame of acetylene gas such as Prest-0-Lit.e gas, it is not necessary to protect the teeth in any way, as the oxygen is burned in the gas flame and oxidation of the surface of the steel does not occur. If the gas torch has an air line on it for compressed air, be sure that this air line is shut off while heating the file, as this excess air will cause oxidation of the file teeth. Dental chisels are a useful item to the gunsmith as they are made of very good steel, can be obtained in a variety of shapes and widths and will cut soft steels easily. They are excellent as small scrapers. When front sight ramps are soldered to barrels, they will remove excess solder squeezed out from under the ramp better than anything else. Reamers of the above types are supplied in both fractional-inch sizes and in millimeter sizes. These millimeter sizes are made by The Morse Twist Drill & Machine Co. of New Bedford, Massachusetts. 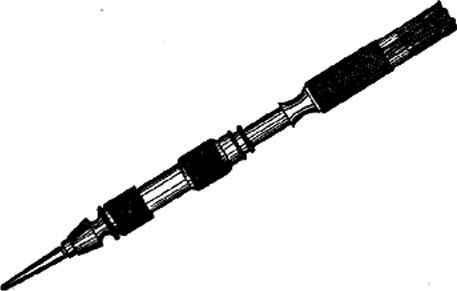 The Alvord-Polk Tool Co. of Millersburg, Pennsylvania, supplies Critchley type reamers in sizes as small as J4". 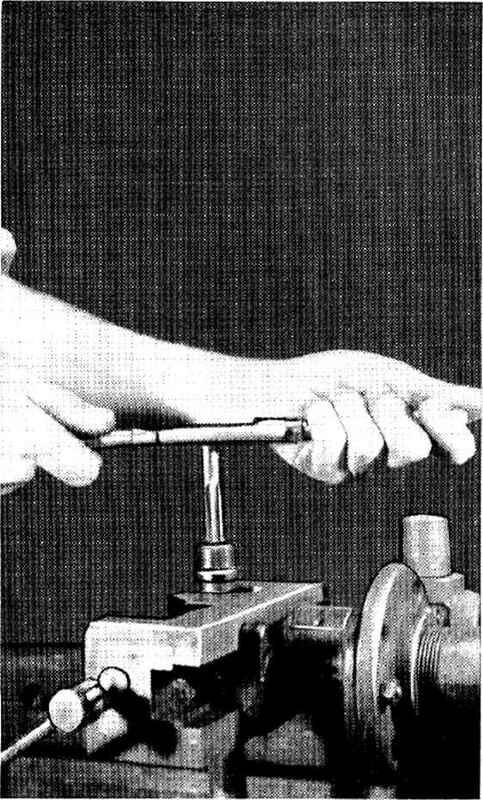 The Greenfield Tap & Die Corp. of Greenfield, Massachusetts, makes an expansion reamer of the Critchley type from up called the Reamrite Hand Adjustable Reamer, in which shims are inserted beside the blades. To sharpen these reamers, you place the shims in front of the blades, insert the reamer in the lathe on centers and proceed to grind the blades circular while the reamer is turning, by using an electric tool post grinder, just as you would grind a shaft to reduce its diameter. After the blades have been ground sharp, the shims are removed from in front of the blades and are placed behind them, thus moving the cutting edge ahead of center and giving a circular relief to the cutting edge of the blades. These reamers can be sharpened by a novice in one-third of the time nccessary to sharpen the other type. Fine taper reamers in wire gauge sizes, called English broachcs, are listed by William Dixon, Inc. of Newark, New Jersey. These are fine reamers for enlarging peep sight holes and also for tapering firing-pin holes in single-shot rifle actions and in shotguns, after bushing the brcech-block for a smaller firing-pin nose. Taps and dies are supplied by Greenfield Tap & Die Corp. and in dies, their Little Giant, type are the easiest to adjust oversize or undersize, for tight or loose fits. Gun screws arc a finer thread than standard threads and must either be cut on a lathe or by a special die. Special dies are usually expensive, so it is cheaper to cut these screws on a lathe, unless there are certain sizes quite often in demand and if this is the case a simple button die of the solid type can be easily made. Stages in the making of a button die blank for cutting small receiver and sight base screws. it again in the oil bath. Make a second die just like this, using the other tap to cut the thread with and you can then turn out any length screw you need in a very few minutes. Dies for other size screws are made in the same way, but for large sizes use a larger drill than to drill the relief holes. Special taps may be made on the lathe and hardened by the same method as was used for the dies. These may be relieved by hand with a file, using a standard tap of the same diameter for a pattern. In making taps on the lathe, cut the grooves first before cutting the thread on the blank, or metal from the grooves will be turned out in a burr into the threads and it is very difficult to clean out. Use drill-rod to make the tap blank, as this hardens easily, and in tempering the taps heat from the shank end, letting the shank and the first thread or two below the shank come to a purple color before quenching. Hack saws are supplied in several different thicknesses, for cutting and slotting purposes. For ordinary cutting work, the standard high-speed steel blade works the best, and for slotting the L. S. Starrett Co. of Athol, Massachusetts makes several different thicknesses of blades, thicker than the standard blade, in both fine teeth and coarse teeth, in 8" length. A thinner blade, which is also narrower and about 6" long, can be obtained in most hardware and ten-cent stores, this is good for slotting screws for standard screw-driver blades. The hack saw frame should be of a heavy type, adjustable for different length blades up to 12" and this is the length blade to buy for ordinary purposes. How to hammer forge a 9mm barrel diy?